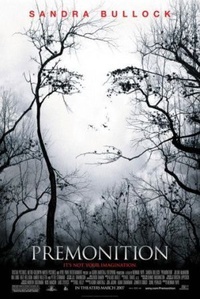 Premonition is a 2007 American drama supernatural thriller film directed by Mennan Yapo and starring Sandra Bullock, Julian McMahon, and Amber Valletta. The film's plot depicts a depressed housewife named Linda who experiences premonitions about her husband's death and the events that follow afterward and how she attempts to save him from his impending doom. Contrary to popular belief, the film is not a remake of the 2004 Japanese horror film Premonition and is its own original story. • Sandra Bullock thought 'Monster' husband was a "chauvinist bigot"
This webpage uses material from the Wikipedia article "Premonition_%282007_film%29" and is licensed under the GNU Free Documentation License. Reality TV World is not responsible for any errors or omissions the Wikipedia article may contain.